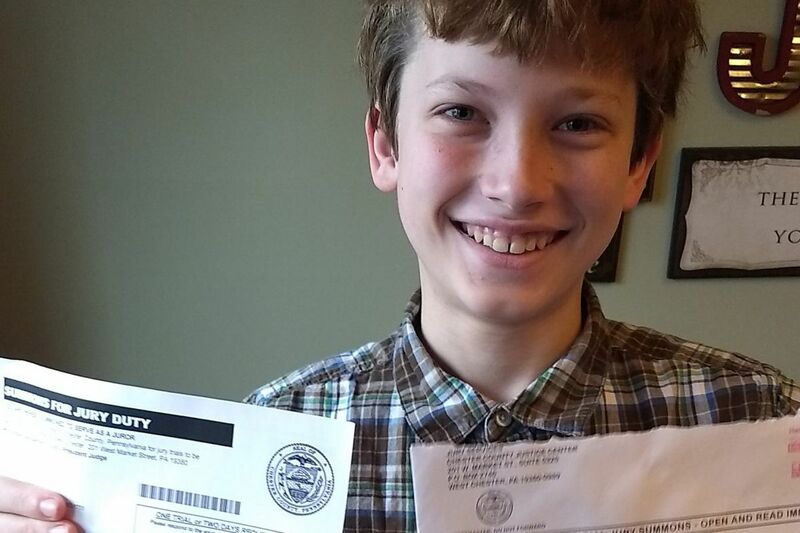 Luke Fox, 11, was summoned to jury duty in West Chester. Even if you're 11 years old and a Boy Scout, you might have a bit of trouble getting excused from jury duty. Luke Fox of West Chester learned how serious his local courts are when he received a jury summons this month and his mother, Jeanette, went online to contact court officials. There was an option to request an exemption for those 70 or older, but no boxes to check for those too young, she said. The minimum age for jury service is 18. So Fox said she did the next best thing — she selected the exemption box that said "full-time student" and noted that her son goes to Glen Acres Elementary School. She thought that would be the end of it, but a message popped up saying her son would still have to show up at the courthouse next month unless he heard back from the courts before then. Not that Luke didn't want to serve. "He was really excited when the summons came in the mail, and wanted to go," his mother said. Luke is a Boy Scout with Willistown Troop 78, and had toured the Chester County Courthouse last year as a Cub Scout. He even got the chance to sit in the jury box and was impressed, she said. Fox said she decided to call the 800 number for help in getting the jury summons dismissed. But she got a recording and had to call another number to get a person on the line. "The lady didn't sound surprised when I told her the story. … She said the county had changed the company that pulls the lists of people who get summonses," she said. Fox said the error was finally corrected, but lamented: "there's got to be an easier way to opt out." There was no comment Monday from the courts, since they were closed for Presidents Day.